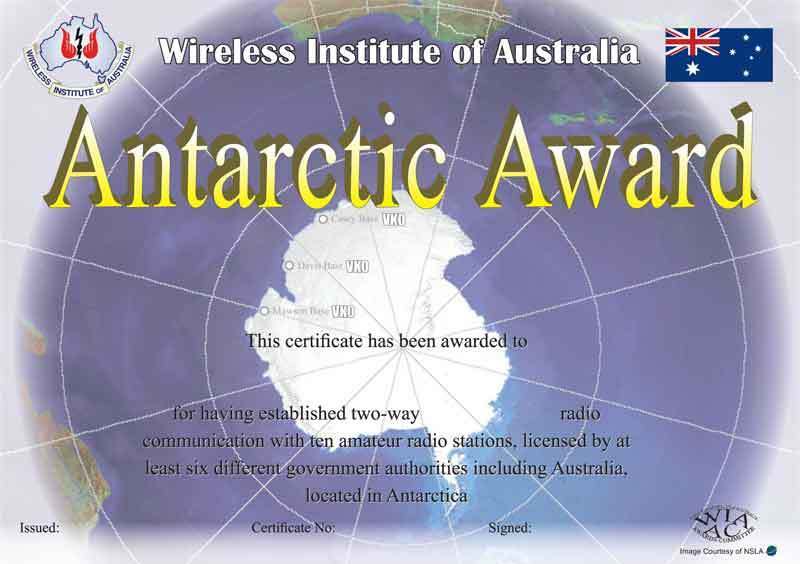 Recognition of at least 10 confirmed contacts with Amateur Radio stations conducting valid operations from Antarctica. Antarctica is defined as the landmass, including islands and permanent ice shelf, below 60 degrees south latitude. This includes Peter I (Norway), South Shetland (UK) and South Orkney (UK) islands. (This excludes Heard, Macdonald and Macquarie Islands as qualification for the award, being sub-Antarctic). Antarctica, for purposes of this award, is defined as the landmass, including islands and permanent ice shelf, below 60 degrees south latitude. This includes Peter I (Norway), South Shetland (UK) and South Orkney (UK) islands. (Heard, Macdonald and Macquarie Islands do NOT qualify, as they are considered “sub-Antarctic”). • The minimum number of contacts for this award is ten (10), from at least six (6) different licensing authorities (i.e. KC4, ZL, UA, HA, SP, LU, CE etc), one (1) of which must be from Australia (VK0/VI0/AX0). All applications must be made using the online award system. The Awards Committee can provide support to migrate from existing Excel forms. All QSO’s must have been made since 23 February 1988 [Antarctic award only]. Do not send QSL cards with application. However, all QSL’s must be in possession of the applicant and may be requested at anytime. QSO’s made on ‘nets’ are acceptable as long as the basic QSO information [callsign & signal report] is exchanged and confirmed unassisted. Prearranged contacts [skeds] or via ‘nets’ are acceptable as long as the other criteria are met. The information listed on application must accurately match the information on the QSL cards. QSO’s may be made using multiple callsigns providing each call used was issued to the applicant at the time of the claimed QSO(s) and all contacts were made from the same DXCC entity. Scanned copy of multiple licenses may be requested to prove the license(s) was/were issued to you at the time of the claimed QSO(s). All QSO’s claimed must be on bands/sub-bands/modes/power-levels permitted by the licensing authority for that class of license at the time of the contact. DIGITAL: RTTY [FSK/AFSK], PSK, AMTOR, PACTOR, OLIVIA, CLOVER, JTnn, SSTV*, HELL, and all other forms of digital transmission/reception. Club and Society Stations may also apply for awards. Certificates will be awarded to the Club. An officer of the club or society must sign the application, indicating their position. QRP endorsement is available for all awards. QSL cards must clearly indicate that the applicant’s power was 5-watts or less output. Description of QRP transmitter and method used to measure output power must be provided. If one or more QSL is requested as part of the processing procedure, they may be posted by airmail (with return postage or 1 IRC and return envelope) or scanned and emailed as attachments in “.JPG” format and of a high enough DPI to be clearly viewed. Applications that are considered unacceptable by the Awards Committee will be rejected and the applicant notified of the reason for rejection. The rejected application can be resubmitted once the reasons for rejection have been corrected. An application rejected three (3) times will not be further considered. If callsign of applicant has changed, they may apply to have the change shown on the standings instead of the old callsign, as long as it relates to the same country as the original application. Signatures of witnesses are not required on electronic applications, but, each witness must understand that they may be contacted to verify that they have witnessed the application as being accurate and truthful.